Kids-in-Mind.com website is an excellent resource to help parents and children select age-appropriate movies or movies that align with your family’s values. The advent of media and technology has proven to be one of the most visible, influential, and important changes over the 100 years. The average eight- to 18-year old American spends six hours a day using or viewing some type of media; 11- and 12-year-olds spend an average of eight hours a day. The average preschool child spends more than three hours a day using or viewing media. In 2011, the average American home had three television sets, two to four phones, and at least one computer in the home with Internet access. In addition, most people carry cell phones, digital music players, and even have televisions in their vehicles. The media acts as a potent persuader of opinions about everything from authority to morality. It can support or tear down what parents teach children. Media does not influence behavior directly, but it can influence values. In turn, values influence decisions concerning right and wrong, which influence behavior. Parenting requires tough viewing decisions. Parents might argue that what they watch as parents is irrelevant because children do not know what parents watch after hours or alone. However, something occurs when children realize what parents really view: they learn that their parents’ actions don’t align with their words and the values they claim to hold. This dichotomy erodes your parental authority and undermines what you are trying to teach your children. For example, parents should set acceptable limits of violence in what they’ll allow themselves—and their children—to view as entertainment. Additionally, it is important for parents to talk with children about the content of what they see and watch on television, on the Internet, and in theaters. Discuss values and limits expected of children when alone or away from family. With diligence and consistency, parents can empower children to set personal boundaries for media viewing. Possible topics of discussion and the types of questions a film may raise in the minds of children. 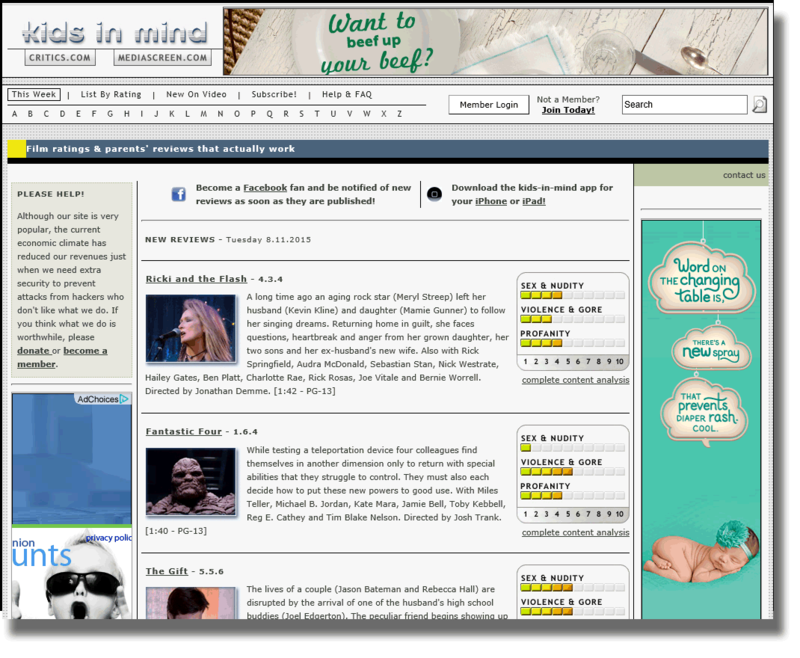 Full view of kids-in-mind homepage with the latest movies shown. These Kids in Mind movie ratings help parents make intelligent decisions about what movies they take their children to. The Kids in Mind movies site immediately updates its information as soon as a new movie is released. If you’re unsure if you should take your kids to a move, check it out before you go. Kids-in-mind.com movie review page for “Home” is shown. It includes a summary of the movie and the items that may not be appropriate for children. Finally, the movies are organized alphabetically and there is a powerful search function.